Hi, BDSG! It's your grandfather, Phinneas. Though I suppose you knew that already if you read the return address. You always were so smart. It's been quite along time since I've seen you. I'd come to the city, but I'm really getting on in years and I don't think I could handle the journey at my age. Perhaps you could come visit me and your grandmother in Farnsbury. I have something I'd love your help with, too. If you have the time. Hope to see you soon. 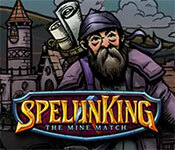 This game has a free trial version, click to start SpelunKing: The Mine Match Free Download. If you like it, please buy the full version to support the developer, thanks. Sign-up to get informed when the SpelunKing series has new game released with BD Studio Games' FREE bi-weekly newsletter.